SUBHEAD: If intermittent sources of energy cannot support grid electricity it doesn't mean we should not go there. (https://ourfiniteworld.com/2016/08/31/intermittent-renewables-cant-favorably-transform-grid-electricity/). See original article for all graphic figures that support Tverberg's position on renewable energy and the Electric Grid. 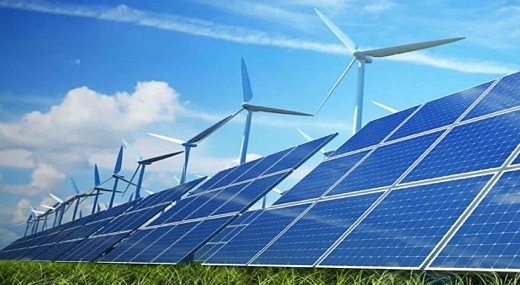 Image above: Photo-illustration of wind and solar energy supporting the grid in an article titled "US Electrical Grid More Reliable with Renewables". Gail would say that's a bit optimistic. From (http://www.energydigital.com/renewableenergy/3226/US-Electrical-Grid-More-Reliable-with-Renewables). We are already encountering major grid problems, even with low penetrations of intermittent renewable electricity: US, 5.4% of 2015 electricity consumption; China, 3.9%; Germany, 19.5%; Australia, 6.6%. In fact, I have come to the rather astounding conclusion that even if wind turbines and solar PV could be built at zero cost, it would not make sense to continue to add them to the electric grid in the absence of very much better and cheaper electricity storage than we have today. There are too many costs outside building the devices themselves. It is these secondary costs that are problematic. Also, the presence of intermittent electricity disrupts competitive prices, leading to electricity prices that are far too low for other electricity providers, including those providing electricity using nuclear or natural gas. The tiny contribution of wind and solar to grid electricity cannot make up for the loss of more traditional electricity sources due to low prices. Leaders around the world have demanded that their countries switch to renewable energy, without ever taking a very close look at what the costs and benefits were likely to be. A few simple calculations were made, such as “Life Cycle Assessment” and “Energy Returned on Energy Invested.” These calculations miss the fact that the intermittent energy being returned is of very much lower quality than is needed to operate the electric grid. They also miss the point that timing and the cost of capital are very important, as is the impact on the pricing of other energy products. This is basically another example of a problem I wrote about earlier, Overly Simple Energy-Economy Models Give Misleading Answers. Let’s look at some of the issues that we are encountering, as we attempt to add intermittent renewable energy to the electric grid. Issue 1. Grid issues become a problem at low levels of intermittent electricity penetration. In 2015, wind and solar PV amounted to only 12.2% of total electricity consumed in Hawaii, based on EIA data. Even at this low level, Hawaii is encountering sufficiently serious grid problems that it has needed to stop net metering (giving homeowners credit for the retail cost of electricity, when electricity is sold to the grid) and phase out subsidies. Hawaii consists of a chain of islands, so it cannot import electricity from elsewhere. This is what I mean by “Generation = Consumption.” There is, of course, some transmission line loss with all electrical generation, so generation and consumption are, in fact, slightly different. The situation is not too different in California. The main difference is that California can import non-intermittent (also called “dispatchable”) electricity from elsewhere. It is really the ratio of intermittent electricity to total electricity that is important, when it comes to balancing. California is running into grid issues at a similar level of intermittent electricity penetration (wind + solar PV) as Hawaii–about 12.3% of electricity consumed in 2015, compared to 12.2% for Hawaii. Issue 2. The apparent “lid” on intermittent electricity at 10% to 15% of total electricity consumption is caused by limits on operating reserves. Electric grids are set up with “operating reserves” that allow the electric grid to maintain stability, even if a large unit, such as a nuclear power plant, goes offline. These operating reserves typically handle fluctuations of 10% to 15% in the electricity supply. If additional adjustment is needed, it is possible to take some commercial facilities offline, based on agreements offering lower rates for interruptible supply. It is also possible for certain kinds of power plants, particularly hydroelectric and natural gas “peaker plants,” to ramp production up or down quickly. Combined cycle natural gas plants also provide reasonably fast response. In theory, changes can be made to the system to allow the system to be more flexible. One such change is adding more long distance transmission, so that the variable electricity can be distributed over a wider area. This way the 10% to 15% operational reserve “cap” applies more broadly. Another approach is adding energy storage, so that excess electricity can be stored until needed later. A third approach is using a “smart grid” to make changes, such as turning off all air conditioners and hot water heaters when electricity supply is inadequate. All of these changes tend to be slow to implement and high in cost, relative to the amount of intermittent electricity that can be added because of their implementation. Issue 3. When there is no other workaround for excess intermittent electricity, it must be curtailed–that is, dumped rather than added to the grid. Overproduction without grid capacity was a significant problem in Texas in 2009, causing about 17% of wind energy to be curtailed in 2009. At that time, wind energy amounted to about 5.0% of Texas’s total electricity consumption. The problem has mostly been fixed, thanks to a series of grid upgrades allowing wind energy to flow better from western Texas to eastern Texas. In 2015, total intermittent electricity from wind and solar amounted to only 10.1% of Texas electricity. Solar has never been large enough to be visible on the chart–only 0.1% of consumption in 2015. The total amount of intermittent electricity consumed in Texas is only now beginning to reach the likely 10% to 15% limit of operational reserves. Thus, it is “behind” Hawaii and California in reaching intermittent electricity limits. Based on the modeling of the company that oversees the California electric grid, electricity curtailment in California is expected to be significant by 2024, if the 40% California Renewable Portfolio Standard (RPS) is followed, and changes are not made to fix the problem. Issue 4. When all costs are included, including grid costs and indirect costs, such as the need for additional storage, the cost of intermittent renewables tends to be very high. 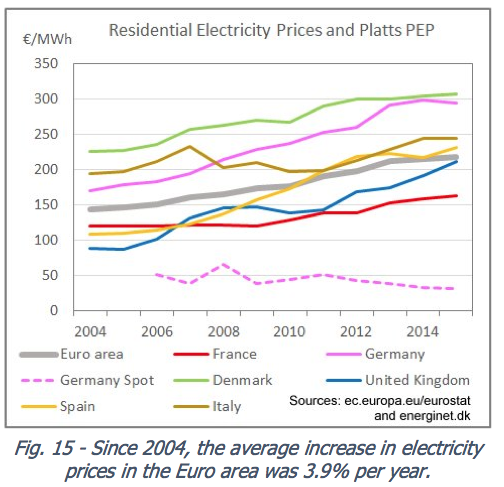 In Europe, there is at least a reasonable attempt to charge electricity costs back to consumers. In the United States, renewable energy costs are mostly hidden, rather than charged back to consumers. This is easy to do, because their usage is still low. Euan Mearns finds that in Europe, the greater the proportion of wind and solar electricity included in total generation, the higher electricity prices are for consumers. The five countries shown in red have all had financial difficulties. High electricity prices may have contributed to their problems. The United States is not shown on this chart, since it is not part of Europe. If it were, it would be a bit below, and to the right of, Czech Republic and Romania. Issue 5. The amount that electrical utilities are willing to pay for intermittent electricity is very low. Clearly, adding intermittent electricity allows a utility to reduce the amount of fossil fuel energy that it might otherwise purchase. In some cases, the addition of solar electricity slightly reduces the amount of new generation needed. This reduction occurs because of the tendency of solar to offer supply when the usage of air conditioners is high on summer afternoons. Of course, in advanced countries, the general tendency of electricity usage is down, thanks to more efficient light bulbs and less usage by computer screens and TV monitors. Many more hook-ups to generation devices are needed. Homes now need two-way connections, instead of one-way connections. Someone needs to service these connections and check for problems. Besides intermittency problems, the mix of active and reactive power may be wrong. The generation sources may cause frequency deviations larger than permitted by regulations. More long-distance electricity transmission lines are needed, so that the new electricity can be distributed over a wide enough area that it doesn’t cause oversupply problems when little electricity is needed (such as weekends in the spring and fall). As electricity is transported over longer distances, there is more loss in transport. To mitigate some of these problems, there is a need for electricity storage. This adds two kinds of costs: (1) Cost for the storage device, and (2) Loss of electricity in the process. 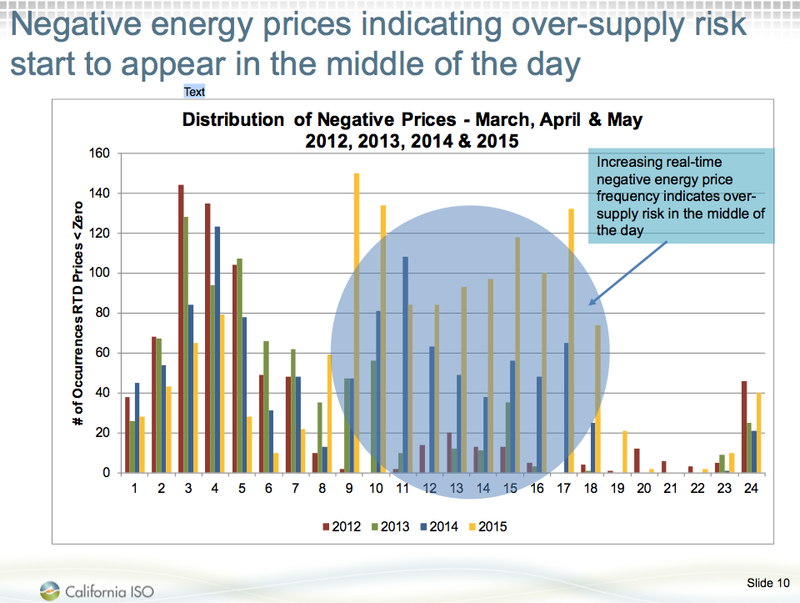 As I will discuss later, intermittent energy tends to lead to very low wholesale electricity prices. Other electricity providers need to be compensated for the effects these low prices cause; otherwise they will leave the market. To sum up, when intermittent electricity is added to the electric grid, the primary savings are fuel savings. At the same time, significant costs of many different types are added, acting to offset these savings. In fact, it is not even clear that when a comparison is made, the benefits of adding intermittent electricity are greater than the costs involved. According to the EIA’s 2015 Wind Technologies Market Report, the major way intermittent electricity is sold to electric utilities is as part of long term Power Purchase Agreements (PPAs), typically lasting for 20 years. Utilities buy PPAs as a way of hedging against the possibility that natural gas prices will rise in the future. The report indicates that the recent selling price for PPAs is about $25 to $28 per MWh (Figure 6). This is equivalent to 2.5 to 2.8 cents per kWh, which is very inexpensive. In effect, what utilities are trying to do is hedge against rising fuel prices of whatever kind they choose to purchase. They may even be able to afford to make other costly changes, such as more transmission lines and energy storage, so that more intermittent electricity can be accommodated. Issue 6. When intermittent electricity is sold in competitive electricity markets (as it is in California, Texas, and Europe), it frequently leads to negative wholesale electricity prices. It also shaves the peaks off high prices at times of high demand. In states and countries that use competitive pricing (rather than utility pricing, used in some states), the wholesale price of electricity price varies from minute to minute, depending on the balance between supply and demand. When there is an excess of intermittent electricity, wholesale prices often become negative. Figure 7 shows a chart by a representative of the company that oversees the California electric grid. Clearly, the number of negative price spikes increases, as the proportion of intermittent electricity increases. A similar problem with negative prices has been reported in Texas and in Europe. When solar energy is included in the mix of intermittent fuels, it also tends to reduce peak afternoon prices. Of course, these minute-by-minute prices don’t really flow back to the ultimate consumers, so it doesn’t affect their demand. Instead, these low prices simply lead to lower funds available to other electricity producers, most of whom cannot quickly modify electricity generation. Clearly, wholesale electricity prices have been trending downward, while residential electricity prices have been rising. In fact, if prices for nuclear, natural gas, and coal-fired electricity had been fair prices for these other providers, residential electricity prices would have trended upward even more quickly than shown in the graph! Note that the recent average wholesale electricity price is about 30 euros per MWh, which is equivalent to 3.0 cents per kWh. In US dollars this would equate to $36 per MWh, or 3.6 cents per kWh. These prices are higher than prices paid by PPAs for intermittent electricity ($25 to $28 per MWh), but not a whole lot higher. The problem we encounter is that prices in the $36 MWh range are too low for almost every kind of energy generation. A price of $36 per MWh is way down at the bottom of the chart, between 0 and 50. Pretty much no energy source can be profitable at such a level. Too much investment is required, relative to the amount of energy produced. We reach a situation where nearly every kind of electricity provider needs subsidies. If they cannot receive subsidies, many of them will close, leaving the market with only a small amount of unreliable intermittent electricity, and little back-up capability. This same problem with falling wholesale prices, and a need for subsidies for other energy producers, has been noted in California and Texas. The Wall Street Journal ran an article earlier this week about low electricity prices in Texas, without realizing that this was a problem caused by wind energy, not a desirable result! Issue 7. Other parts of the world are also having problems with intermittent electricity. Germany is known as a world leader in intermittent electricity generation. Its intermittent generation hit 12.2% of total generation in 2012. As you will recall, this is the level where California and Hawaii started to reach grid problems. By 2015, its intermittent electricity amounted to 19.5% of total electricity generated. Figure 10. 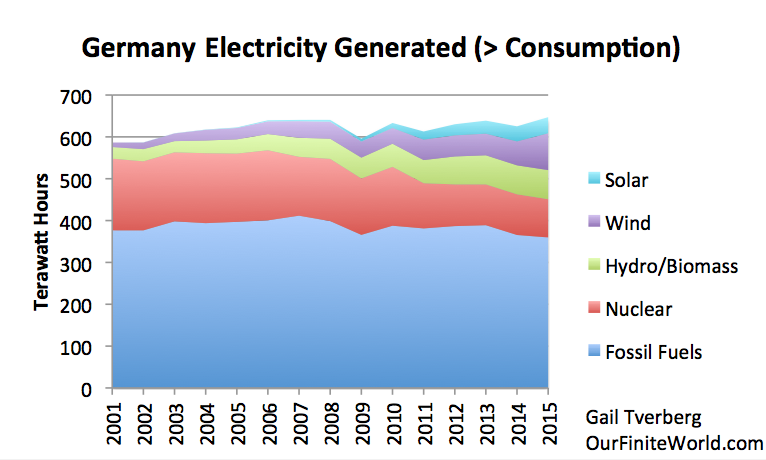 German electricity generated, based on BP Statistical Review of World Energy 2016. Needless to say, such high intermittent electricity generation leads to frequent spikes in generation. Germany chose to solve this problem by dumping its excess electricity supply on the European Union electric grid. Poland, Czech Republic, and Netherlands complained to the European Union. As a result, the European Union mandated that from 2017 onward, all European Union countries (not just Germany) can no longer use feed-in tariffs. Doing so provides too much of an advantage to intermittent electricity providers. In Australia, one recent headline was Australia Considers Banning Wind Power Because It’s Causing Blackouts. The problem seems to be in South Australia, where the last coal-fired power plants are closing because subsidized wind is leading to low wholesale electricity prices. Australia, as a whole, does not have a high intermittent electricity penetration ratio (6.6% of 2015 electricity consumption), but grid limitations mean that South Australia is disproportionately affected. China has halted the approval of new wind turbine installations in North China because it does not have grid capacity to transport intermittent electricity to more populated areas. Also, most of China’s electricity production is from coal, and it is difficult to use coal to balance with wind and solar because coal-fired plants can only be ramped up slowly. China’s total use of wind and solar is not very high (3.9% of consumption in 2015), but it is already encountering major difficulties in grid integration. Issue 8. The amount of subsidies provided to intermittent electricity is very high. At the federal level, the production or investment tax credit and double-declining accelerated depreciation can pay for two-thirds of a wind power project. Additional state incentives, such as guaranteed markets and exemption from property taxes, can pay for another 10%. If we believe this statement, the developer only pays about 23% of the cost of a wind energy project. The US Energy Information Administration prepared an estimate of certain types of subsidies (those provided by the federal government and targeted particularly at energy) for the year 2013. These amounted to a total of $11.3 billion for wind and solar combined. About 183.3 terawatts of wind and solar energy was sold during 2013, at a wholesale price of about 2.8 cents per kWh, leading to a total selling price of $5.1 billion dollars. If we add the wholesale price of $5.1 billion to the subsidy of $11.3 billion, we get a total of $16.4 billion paid to developers or used in special grid expansion programs. This subsidy amounts to 69% of the estimated total cost. Any subsidy from states, or from other government programs, would be in addition to the amount from this calculation. Paul-Frederik Bach shows a calculation of wind energy subsidies in Denmark, comparing the prices paid under the Public Service Obligation (PSO) system to the market price for wind. His calculations show that both the percentage and dollar amount of subsidies have been rising. In 2015, subsidies amounted to 66% of the total PSO cost. by comparing paid for wind under PSO with market value of wind energy. In a sense, these calculations do not show the full amount of subsidy. If renewables are to replace fossil fuels, they must pay taxes to governments, just as fossil fuel providers do now. Energy providers are supposed to provide “net energy” to the system. The way that they share this net energy with governments is by paying taxes of various kinds–income taxes, property taxes, and special taxes associated with extraction. If intermittent renewables are to replace fossil fuels, they need to provide tax revenue as well. Current subsidy calculations don’t consider the high taxes paid by fossil fuel providers, and the need to replace these taxes, if governments are to have adequate revenue. Also, the amount and percentage of required subsidy for intermittent renewables can be expected to rise over time, as more areas exceed the limits of their operating reserves, and need to build long distance transmission to spread intermittent electricity over a larger area. This seems to be happening in Europe now. In 2015, the revenue generated by the wholesale price of intermittent electricity amounted to about 13.1 billion euros, according to my calculations. In order to expand further, policy advisor Daniel Genz with Vattenfall indicates that grids across Europe will need to be upgraded, at a cost of between 100 and 400 billion euros. In other words, grid expenditures will be needed that amount to between 7.6 and 30.5 times wholesale revenues received from intermittent electricity in 2015. Most of this will likely need to come from additional subsidies, because there is no possibility that the return on this investment can be very high. There is also the problem of the low profit levels for all of the other electricity providers, when intermittent renewables are allowed to sell their electricity whenever it becomes available. One potential solution is huge subsidies for other providers. Another is buying a lot of energy storage, so that energy from peaks can be saved and used when supply is low. A third solution is requiring that renewable energy providers curtail their production when it is not needed. Any of these solutions is likely to require subsidies. We already seem to be reaching limits with respect to intermittent electricity supply. The US Energy Information Administration may be reaching the same conclusion. It chose Steve Kean from Kinder Morgan (a pipeline company) as its keynote speaker at its July 2016 Annual Conference. He made the following statements about renewable energy. This view is very similar to mine. Few people have stopped to realize that intermittent electricity isn’t worth very much. It may even have negative value, when the cost of all of the adjustments needed to make it useful are considered. Energy products are very different in “quality.” Intermittent electricity is of exceptionally low quality. The costs that intermittent electricity impose on the system need to be paid by someone else. This is a huge problem, especially as penetration levels start exceeding the 10% to 15% level that can be handled by operating reserves, and much more costly adjustments must be made to accommodate this energy. Even if wind turbines and solar panels could be produced for $0, it seems likely that the costs of working around the problems caused by intermittent electricity would be greater than the compensation that can be obtained to fix those problems. The situation is a little like adding a large number of drunk drivers, or of self-driving cars that don’t really work as planned, to a highway system. In theory, other drivers can learn to accommodate them, if enough extra lanes are added, and the concentration of the poorly operating vehicles is kept low enough. But a person needs to understand exactly what the situation is, and understand the cost of all of the adjustments that need to be made, before agreeing to allow the highway system to add more poorly behaving vehicles. In An Updated Version of the Peak Oil Story, I talked about the fact that instead of oil “running out,” it is becoming too expensive for our economy to accommodate. The economy does not perform well when the cost of energy products is very high. The situation with new electricity generation is similar. We need electricity products to be well-behaved (not act like drunk drivers) and low in cost, if they are to be successful in growing the economy. If we continue to add large amounts of intermittent electricity to the electric grid without paying attention to these problems, we run the risk of bringing the whole system down.